Activities to Enjoy with Your Dog! Many of us have spent hours tossing a ball with our dog. If you have ever wondered "are there other things we could do together?" The answer is a resounding YES! GCOC members enjoy a wide variety of fun and challenging activities with our dogs. Want to teach your dog to perform precise maneuvers in a close relationship with you? The sport of Obedience may be for you! Want to steer your dog through courses of complex obstacles with speed and accuracy? Try Agility! 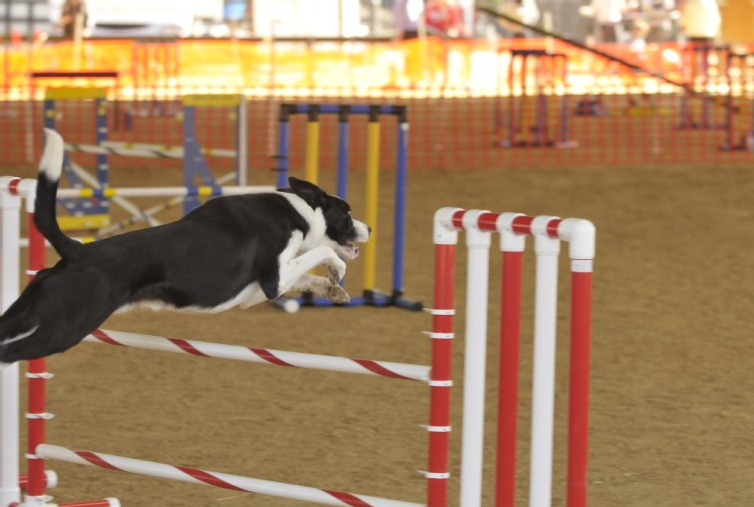 How about working with your dog through fast-paced sequences demonstrating your skills and teamwork? Rally may be your thing! Do you like to dress up (both you and your dog) and dance together to your favorite music? Well, you no longer have to hide your little hobby from friends and family because Canine Freestyle is an official dog sport! And, of course, just teaching your dog to do tricks can be great fun as well. If your dog has a great temperament and can behave well in a variety of situations, you might want to consider the AKC Canine Good Citizen Program. GCOC offers the CGC and CGCA tests throughout the year. If you have a dog for whom helping people seems to be a calling, you might want to consider therapy dog work. GCOC can help you move beyond the tennis ball to find these and other fun, fulfilling, and challenging ways to spend time with your dog. Just click on a dog sport and get started!